Dedicated leadership with a defined vision is the foundation of a progressive organization. On June 19, Monongahela Valley Hospital (MVH) and its parent organization, Mon-Vale Health Resources, Inc. (MVHR) reelected their boards which are comprised of some of the area’s most respected business, medical and community leaders. John D. Fry, of McMurray, president and owner of Procurement Specialty Group, Inc., has been reelected chairman of the Board of Directors of Mon-Vale Health Resources, Inc. and chairman of the Board of Trustees Monongahela Valley Hospital, Inc. This marks Mr. Fry’s fourth term as the leader of the boards. Read more below the image. 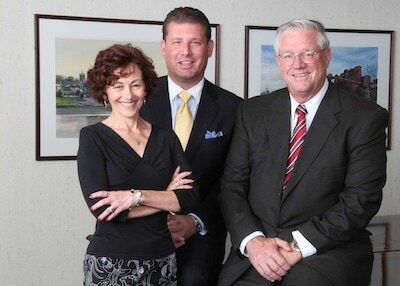 Reelected to Monongahela Valley Hospital’s Board of Trustees and Mon-Vale Health Resources, Inc.’s Board of Directors are pictured left to right R. Carlyn Belczyk, Jeff M. Kotula and John D. Fry. In addition, R. Carlyn Belczyk, of Monessen, was reelected vice chairman and Jeff M. Kotula, of Washington, Pa., was reelected secretary of both boards. These officers also will be serving their fourth terms which begin on July 1. Mr. Fry was elected to the MVHR Board of Directors in 1998 and to the MVH Board of Trustees in 2000. He was elected secretary of both boards in 2005 and is a member of the Executive Committee of both boards. In addition, he has served on the Nominating, By-Laws and Executive Compensation committees and as chairman of the Joint Conference Committee and was appointed chairman of the Finance Committee in 2007. Mrs. Belczyk is a certified public accountant, accredited in business valuations and a certified valuation analyst. She began her career in public accounting in 1986 and together with Randy Guthrie formed Guthrie, Belczyk & Associates, PC of Washington in 1993. She has served on the boards of numerous professional and community organizations including the Washington County Community Foundation. Mr. Kotula is president of the Washington County Chamber of Commerce. He leads the activities of the largest chamber in Washington County and the fourth largest chamber in southwestern Pennsylvania. In this capacity, he serves as both the chamber executive and as director of economic development for Washington County through a public/private partnership comprised of the Washington County Commissioners, Washington County Chamber of Commerce, Washington Industrial Development Corporation and Washington County Industrial Development Authority. In addition to the election of officers, 12 directors were reelected to the MVHR board for three- year terms including: Patrick Ballon, of Brownsville; Richard A. Barcelona, of Canonsburg; Bradley M. Bassi, of Charleroi; R. Carlyn Belczyk; Andrew G. Bury, of Roscoe; Carl Crawley Jr., of New Eagle; Carol Doman, of Belle Vernon; Henry R. Glaneman, of Eighty-Four; William D. Hope Jr., V.M.D., of West Newton; Ronald L. Lombard, D.Ed., of Perryopolis; Anthony M. Lombardi, of Charleroi; and Charles E. Stacey, Ph.D., of Donora. Those reelected to Monongahela Valley Hospital’s Board of Trustees for three-year terms include R. Carlyn Belczyk, Richard A. Barcelona, Bradley M. Bassi and Carl Crawley Jr.